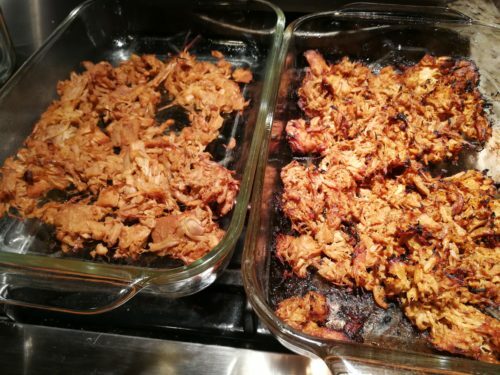 Jackfruit Carnitas Tacos. Who doesn’t love tacos? Most Tuesday nights we will celebrate with #TacoTuesday for dinner. 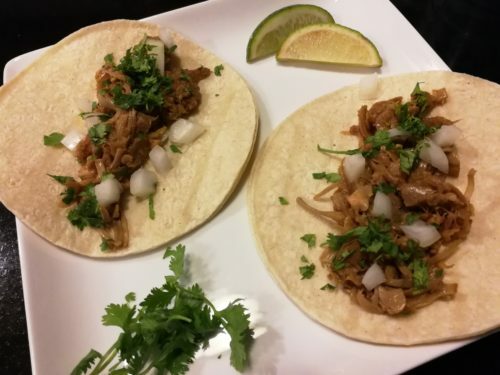 I was looking for a healthier substitute filling for my favorite pork carnitas tacos and the idea of using jackfruit was offered by a vegan friend. 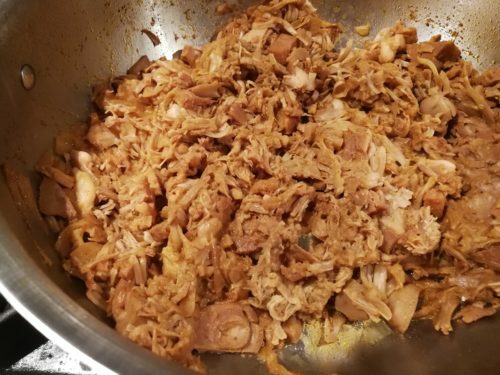 This recipe is based on my own Pork Carnitas but using jackfruit instead of pork. 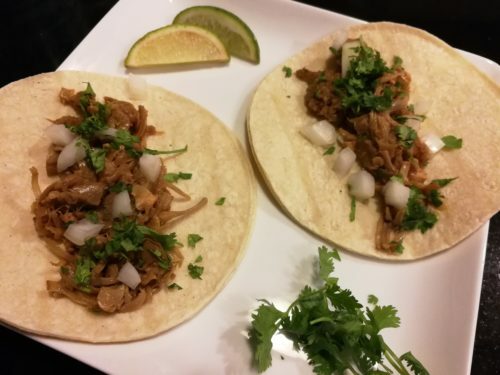 Traditional Pork Carnitas Tacos are made with shredded pork. As you may know, I have a number of friends who are following either vegan or heart-healthy diets. 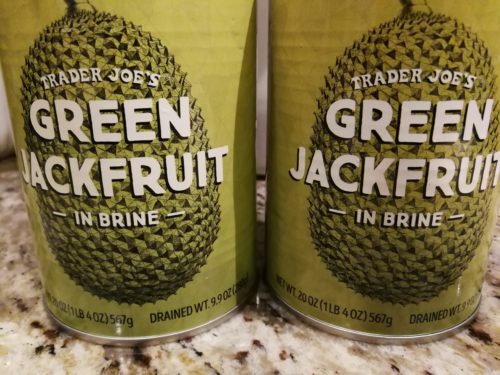 Last month, I bought two cans of jackfruit in brine at Trader Joe’s. 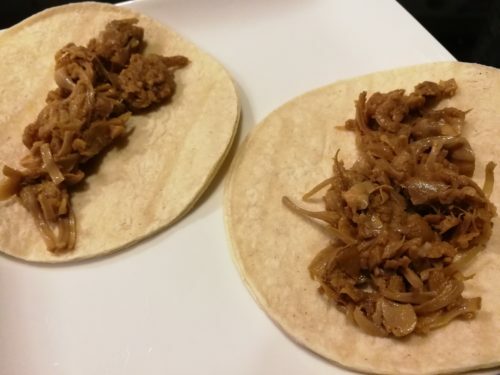 I was interested in trying some carnitas tacos made with jackfruit instead of pork. Jackfruit is high in fiber but has almost no protein as compared to the same size serving of meat. But, don’t let that deter you from trying these tacos! 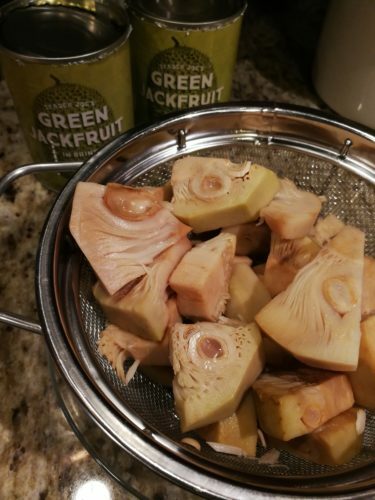 The jackfruit is peeled and cut into chunks in the Trader Joe’s canned version. It’s a little strange-looking if you haven’t seen it before. Just out of the can, jackfruit texture reminded me of the consistency of raw artichoke hearts. When cooked, my husband said the consistency reminded him of cooked cabbage. I’ve not seen fresh jackfruit in my area, even at the Asian supermarkets, so I don’t know how the canned consistency equates to the fresh. Also, I recommend purchasing canned jackfruit in water or brine and not the version that comes in sugary syrup. 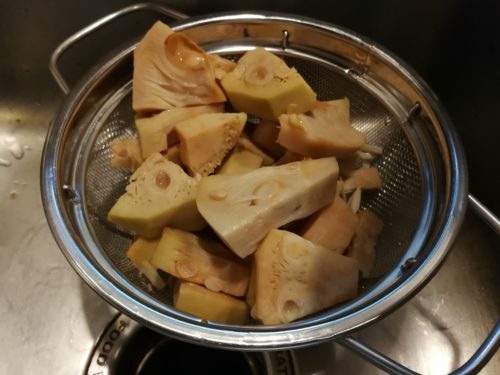 Most other jackfruit recipes that I reviewed recommended to remove the tough cores and the seeds. 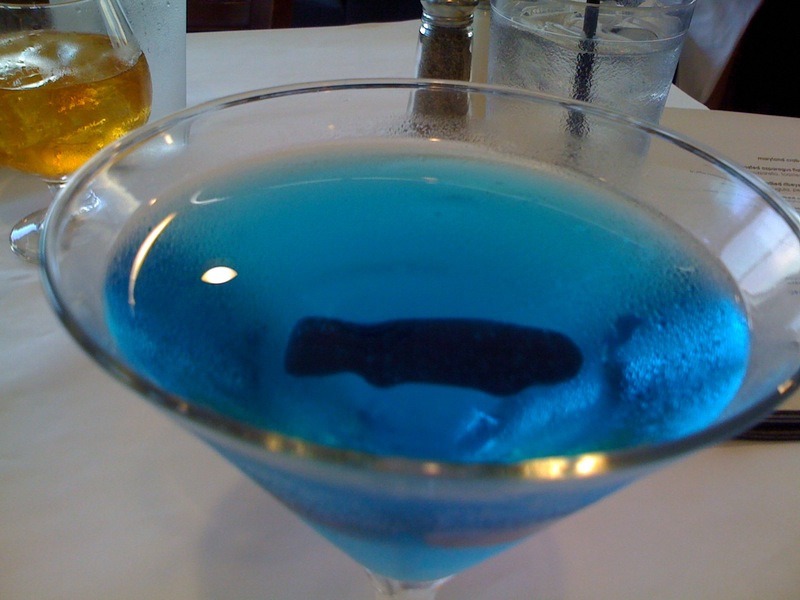 As usual, I didn’t find a recipe that totally worked for me, so I came up with my own. I didn’t remove the tough cores or seeds and just drained and rinsed the jackfruit pieces and they cooked down nicely. 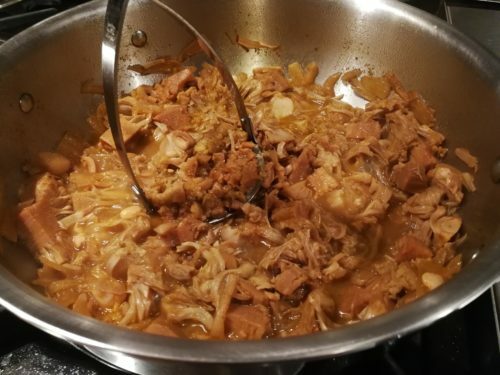 Also, the jackfruit doesn’t necessarily take on just the flavor of the spices that are added as mentioned in many other recipes — it also has its own subtle flavor, kind of like a pear to me. Start out by draining and rinsing the jackfruit. Set aside. 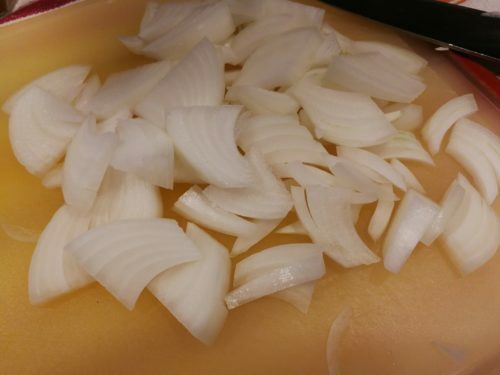 Slice a sweet onion in half and then slice it lengthwise. 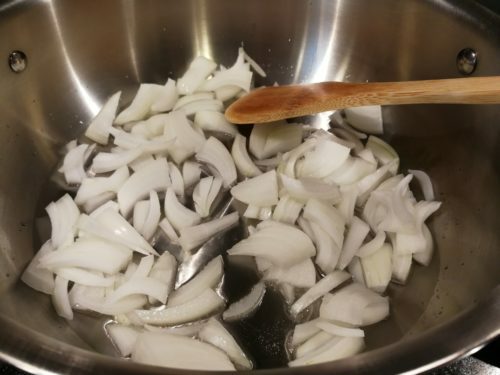 Saute the onion in some olive oil or vegetable broth. Add some minced garlic, cumin powder, Ancho chile powder and chili powder to the onions. Stir in the spices and let cook a few minutes. Add the drained and rinsed jackfruit to the pan. Add some vegetable broth and orange juice. Stir the mixture and bring to a boil over medium heat. 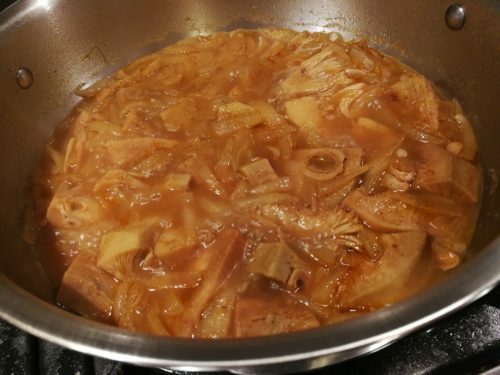 Lower the heat to medium-low and cook the jackfruit, uncovered, for 45 – 60 minutes until it starts to soften. Using a potato masher or two forks, start to mash or pull the jackfruit into smaller pieces. As the jackfruit cooks, continue to mash or pull it. The pulled jackfruit carnitas are now cooked and ready to finish in the oven. 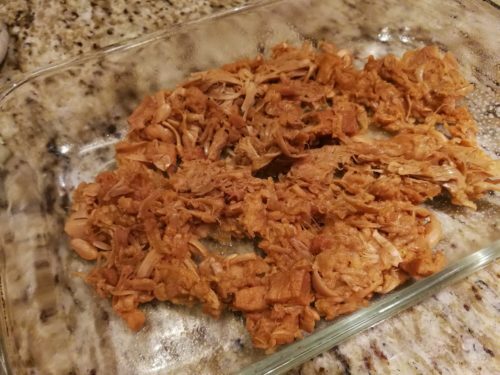 Finish the jackfruit carnitas in your oven under the broiler. Spread the jackfruit carnitas into a single layer in a baking pan. 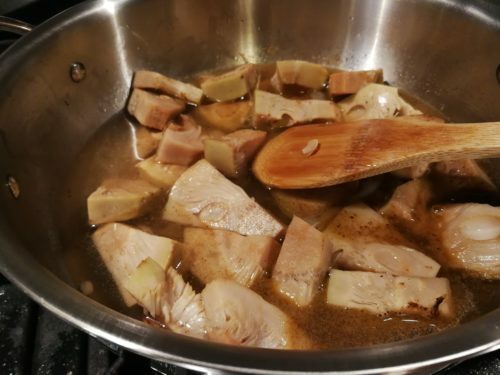 Drizzle some maple syrup over the jackfruit carnitas, season with salt, and broil for a few minutes until they dry out just a bit like real pork carnitas. For comparison, I’m showing the jackfruit carnitas next to real pork carnitas. 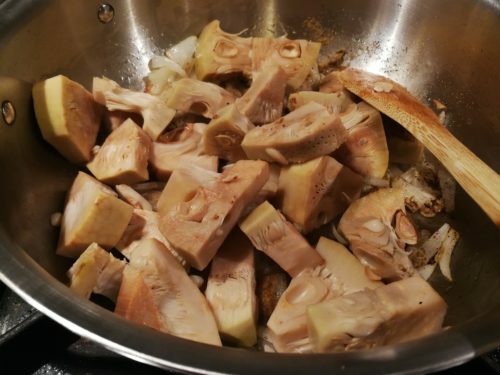 The pork carnitas will blacken a bit more than the jackfruit will blacken. Now you can assemble the tacos. For each taco, use two corn tortillas. You can warm the tortillas in the oven in foil packets or use them at room temperature. 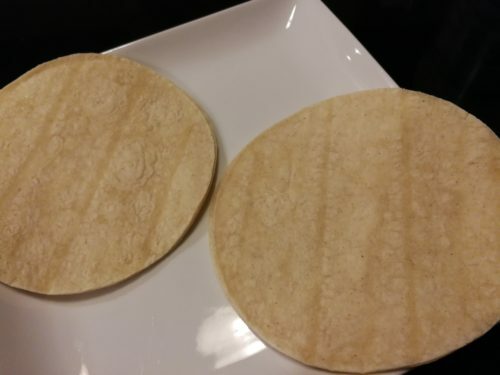 Place the tortillas on serving plates. Spread the jackfruit carnitas filling along the center of the tortillas. Add some chopped sweet onion and chopped cilantro. Serve with lime wedges for squeezing and garnish with cilantro sprigs. Try these tacos with my Zesty Cucumber Pineapple Peach Salsa for a tropical taste. So do I think these jackfruit carnitas tacos taste just like the traditional pork carnitas tacos? No, but I do think the jackfruit carnitas have a similar consistency and are a nice substitute for #MeatlessMonday meals once in a while. And I’m curious to see what my vegan friends think about this recipe. 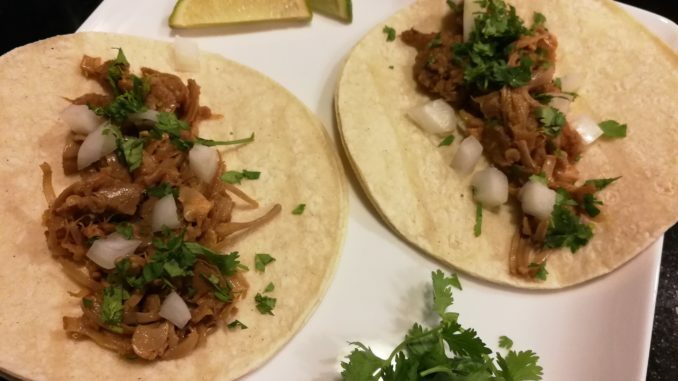 Los Toltecos, a local Mexican restaurant chain, is rumored to marinate its pork in tequila in making its outstanding carnitas — so maybe adding tequila is an option for this jackfruit carnitas tacos recipe. 1. Drain and rinse the jackfruit in a colander. Set aside. 2. In a chef’s pan or large skillet, warm the two tablespoons of olive oil or vegetable stock over medium low heat. 3. 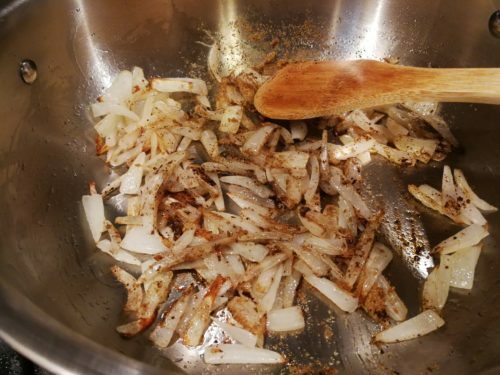 Saute the onion until it becomes translucent and slightly caramelized. 4. Add the garlic, cumin, ancho chile powder and chili powder. Stir the mixture and cook a few minutes. 5. Add the jackfruit and stir. 6. Raise the heat to medium, add the vegetable stock and orange juice, stir, and bring to a boil. 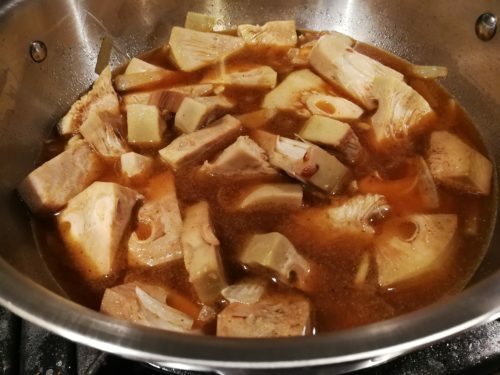 Lower heat to medium-low and let cook, uncovered, until the jackfruit starts to soften, about 45 – 60 minutes. 7. Once you think the jackfruit is softening, use a potato masher to start to “shred” the jackfruit flesh. 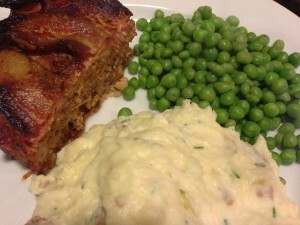 You might find some pieces are still a bit tough but they will soften with continued cooking. Continue to mash or shred as the jackfruit cooks leaving some chunks for texture. Add some water if the jackfruit liquid dries out before the fruit softens completely. 8. 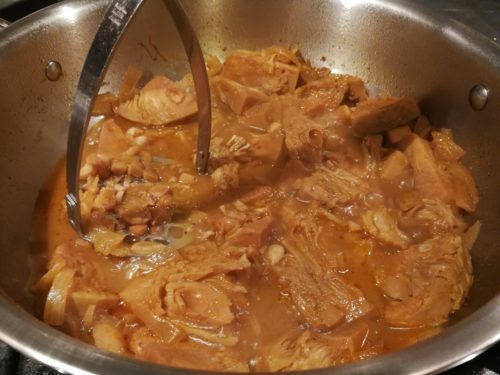 When the jackfruit is shredded and the liquid has mostly evaporated, remove the pan from the heat. 9. Spray a glass Pyrex baking dish with cooking spray or omit the cooking spray by using a non-stick baking dish. 10. Spread out the jackfruit in the baking dish and drizzle with the maple syrup. Season with salt, to taste. 11. Broil the jackfruit in the oven for a few minutes to finish it and give it a drier pork carnitas-like consistency. 12. When the jackfruit has dried out a bit, remove the pan from the oven. Turn off the broiler and set the oven to 350 degrees Fahrenheit. 13. At this point you could heat the soft corn tortillas in foil packets of four in the oven for 2 – 3 minutes. Or you can use the soft corn tortillas at room temperature. 14. To assemble the tacos, use two corn tortillas per taco and place on serving plates. 15. Spoon the jackfruit filling onto the corn tortillas. 16. Top with the diced onion and chopped cilantro. 17. Garnish with lime wedges for squeezing and additional cilantro sprigs. Makes 8 jackfruit carnitas tacos. 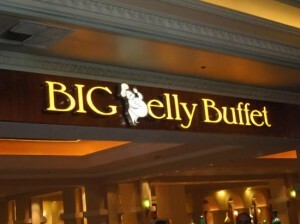 I recommend two tacos per person. Serve with refried beans and a side of guacamole. Offer with sangria or beer. 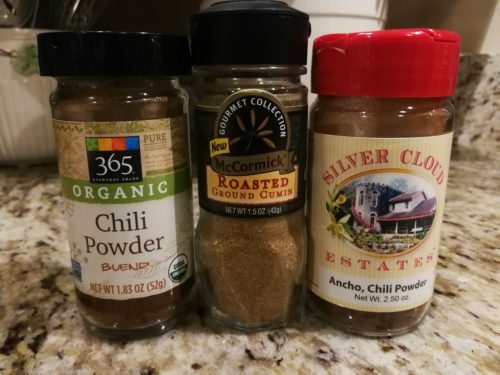 Variations: For a bit more spice, sprinkle in some Mexican oregano with the carnitas as they are cooking. Do not use Italian oregano as it doesn’t taste the same. Add your favorite shredded dairy or vegan cheese to the tacos. Spoon some of my tomato salsa or some of my zesty cucumber pineapple peach salsa onto the tacos. Omit the cilantro if you don’t like it.